In a galaxy far, far away... Actually, not that far since it is right here at home; we are celebrating the release of 'Star Wars: The Last Jedi' this Holiday Season. If you love the craftiness that comes with making the Holidays extra special, and you are also a big fan of the Star Wars franchise, check out our lil' Star Wars themed Christmas Tree, courtesy of our friends at Allied Contigo and Star Wars: The Last Jedi. Plus, watch the official trailer of the film right here at Just Happiling. Let me begin by thanking Allied Contigo, and Star Wars: The Last Jedi, for the cool movie merchandise, and all the items needed to create a Star Wars themed Christmas Tree. With that being said, let me show you how a little DIY, combined with the love and excitement for Star Wars goes a long way. For the most part, this amazing Star Wars Felt kit that was sent to us, comes with pretty much everything you need to create some of your favorite characters from the franchise. With the patterns indicating the right color for each piece, needle, thread, stuffing, and an instruction booklet, it wasn't that hard to get going. It truly brought some childhood memories back, since making felt figurines to decorate the Christmas Tree was something that my grandmother passed to my mother, and then to me. Thus becoming something that I will definitely pass on to the newer generation in our family. I used a white fabric pencil to trace on the darker felt, and a normal pencil for the lighter colors. The closer you place each pattern, the more you will have left over, which will allow you to create even more characters. Darth Vader is one of my favorite characters, but shhh--don't tell anyone: they'll think I've gone to the dark side. You don't need any special skills to sew felt pieces together. The booklet pretty much tells you how to do the stitching, and honestly, it is more of a fun gathering to create something together, rather than making a masterpiece. Can you guess what character I was working on in the photo above? If you said an 'Ewok', you were right! I grew up with these characters in cartoons. They are super adorable, and I love them. I remember one of my older cousins had an original licensed 'Ewok' stuffed doll, from when the movie came out in theaters. I must confess I really wanted to take it home with me, jaja. Nonetheless, now I have my own mini version thanks to this fun kit. After that, I was ready to start with another of my favorite characters; Chewbacca, grrrrrr. If I could choose to be, any character ever in the Star Wars franchise, I think I would like to be Chewy. He's pretty cool, and he gets to be Han Solo's best friend. After having a few 'Rebels', ehem, I mean--characters sewn up, I decided to decorate some of the Christmas Tree ornaments with the temporary tattoos that I also got from our friends at Allied Contigo, check it out. It is as easy as following the instructions. Cut your selected Star Wars: The Last Jedi tattoo, making sure that what you've selected fits the size of your ornament. Place it over the ornament as you would on your skin, get it wet, and gently peel it off. You will end up with something like in the photo below. Then carefully clean it up and you are done. It was super exciting to have these ornaments ready to be placed in our golden mini Christmas Tree. Decorating the Christmas Tree, is something that we really enjoy as a family, although sometimes we can't really agree on the theme. I am sure that many of you might have the same dilemma with your families as well. Now the finishing touch was to add the lights, because what is a Christmas Tree without lights? We also got these awesome mini lights; they look like tiny light sabers. To be honest, I had thought about creating a Star Wars themed Christmas Tree for some time now, since most of the family are fans of the franchise. This opportunity was like if someone had been reading my mind... I think that the team at Allied Contigo must be secretly Jedi. We are super excited that Star Wars: The Last Jedi is now playing in theaters. For us, it is a movie that we can enjoy as a family, because we all love the franchise and we all have our favorite characters that we are anxiously waiting to see in the big screen. Last year, I was pretty impressed by the CGI and special effects in Star Wars: Rouge One. However, we've all been waiting patiently to see what happens with Rey, Finn, BB8, Kylo Ren, and of course Princess Leia. I am also intrigued by many new characters that will be taking on important roles in this film. So many questions unanswered, and so many theories too. Anyways, hopefully we'll find out this weekend, because we are more than ready to see this film. Please continue reading to find out more about Star Wars: The Last Jedi, and to watch the official and last trailer of the film. If you have theories about what will happen next, I would love to read them in a comment below. Don't forget to follow us via social media or by subscribing through email on the right side bar of this blog to keep up-to-date with the latest in Star Wars: The Last Jedi, and many more fun family films. 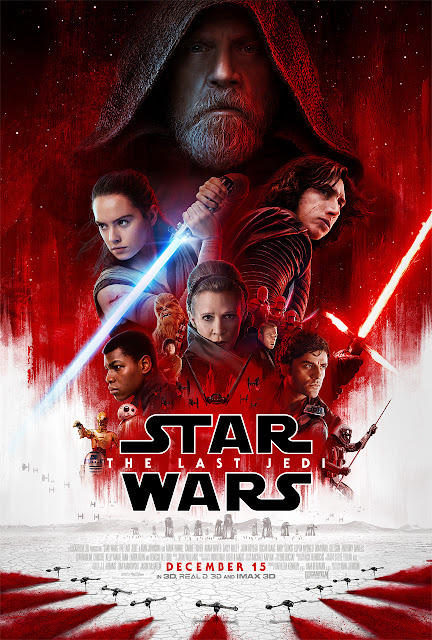 Star Wars: The Last Jedi now playing in U.S. theaters. Now tell us, who is the biggest Star Wars fan in your family? Who is your favorite character? Can you talk like Chewbacca? Let us know in a comment below, we'd love to read you. Until the next time, smile you must, because contagious it is.